I only bought one game at launch and it’s Pilotwings. I’ve swayed back and forward in my mind over how strong a game I think this is. I expected the game to be a kind of fun and relaxing diversion from other games with a fairly casual difficulty level. I was surprised when I found that the game was far harder than I had anticipated. In a way this is a good thing as it forces you to practice and doesn’t allow you to blow through the missions with perfect scores in a day of play. I found myself stuck on the silver level of missions for a long time and didn’t think I would be able to progress to gold. I decided to give up on mission mode for a while and try to complete free flight mode. This mode is a very relaxing experience in which you have a set time per run to explore the islands in your selected vehicle. The object is to discover and collect locations of places of interest as well as white balloons which are scattered around the island, both of which you have to fly into to add to your collection. Once you find a location it is added to a list. Each balloon starts out white and turns coloured once you fly into it. Greyed out white balloons mean that they can only be collected by a different vehicle. Locations can be found regardless of vehicle. For every 10 or so balloons you collect, you earn another 30 seconds of flight time. This is useful for letting you reach the objectives that are a long way from the main island, such as on the golf resort island. I actually ended up completing both of these objectives which was a very satisfying feeling. After that, I tried the same missions I had been struggling on earlier and actually found that I was getting noticeably better each time even if I wasn’t getting great scores. Eventually I did enough to unlock the gold class which also unlocks a new category in the free flight mode. One new objective for each class of aircraft. Stunt rings for planes, mii trophies for rocket belts and gold rings for gliders. Stunt rings are definitely the most tricky of the 3 types as you have to manoeuvre your plane in ways you haven’t been forced to up until this point in the game. Each stunt ring has your mii’s face in a certain position, indicating how your plane should be angled while moving through it. They may be rotating left or right, on their side either way, or most difficult of all, upside down. I’ve found that the easiest way to get the upside down targets is by holding L + R at the same time and then trying to glide into the target that way. The other stunts also use combinations of these buttons. To bank, hold down one of them, to barrel roll, double tap one. You have to be aware of the angle you’re approaching from too, as when you bank or roll you will move in that direction quite strongly. Instead of going further into detail regarding every other minute aspect of the game, I’ll summarise my experience so far with the game. The gameplay of all of the aircraft is fantastic fun and very addictive, which makes the quest for all of the objectives in free flight mode such an addictive and engrossing experience. The mission mode, while it does get very tricky after the first couple of sets of missions, it is also rewarding. While you’ll probably never get a perfect score on most of the later levels due to the sheer number of parameters the game scores you on, it’s still great fun to try. It has been criticised by some as being too short but I think the people saying that are those whole are only really interested in the mission mode. It’s true that they could have done more with that part of the game, but counting that and the hours you could spend in free flight mode, I think you definitely get enough hours of play out of it to make it worth purchasing. Even if you don’t want to purchase it, rent it as its gameplay and 3D effect are good adverts for the system in themselves. Speaking of the 3D, my eyes weren’t comfortable with it on maximum but at mid level 3D you do get a fairly good sense of depth that shouldn’t hurt your eyes in moderation. I just turned the slider to off when I was sick of the 3D but not sick of the game. It’s nice to have the option to do that at least. 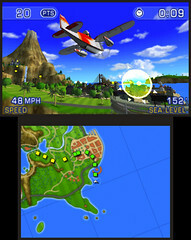 When the launch of the system was fast approaching, I was almost resigned to the fact that I wouldn’t have a game for it for several months at least, as there wasn’t really anything else of interest, or at least not worth buying rather than renting, but Pilotwings Resort is definitely the kind of game that will keep me coming back until the library does get up to Nintendo’s excellent standard. I’m definitely glad I took the chance on it now. I’m also glad I got it for £10 cheaper at amazon than the selling price at the GAME store. Don’t support game’s money grabbing ways if you can find it cheaper elsewhere.